My sister and I were only 6½ and 8½ years old, respectively. We were told of Mémère’s death the next morning, while getting ready for school. Marianne and I were in the small living room of our apartment and could see Dad a few feet away in the kitchen. He looked so sad standing by the counter. Mémère Julie suffered from asthma and sometimes needed an oxygen tent at home. I don’t remember the days leading up to her death, and don’t know if she had been poorly before going to the hospital one last time. I have only a vague memory of being at the funeral home. I think it was evening, and I was there with my parents. I watched people come and go in the sombre and dimly lit room. 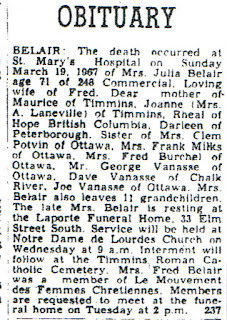 Forty-nine years have passed since that day, but I still miss my grandmother Julie and keep her close to me in my heart. 1. 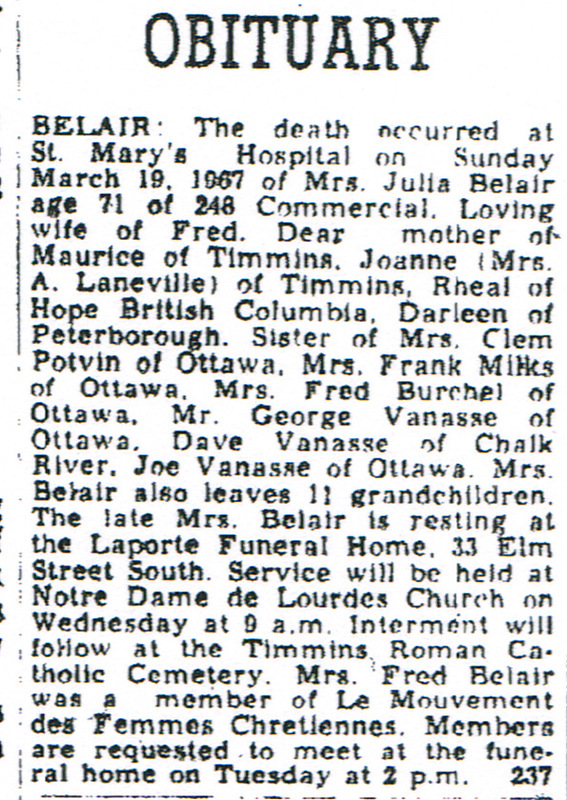 “Belair”, obituary, The Daily Press (Timmins, Ontario), 21 March 1967, p. 9, col. 5.